Biological markers of alcohol consumption can be divided into two groups: direct and indirect markers. Direct markers, as their name implies, directly track the intake of alcohol and vary in their sensitivity and kinetics accordingly. These markers are only produced when a person has drank alcohol – and the amount of alcohol consumed will determine their levels – which ensures accuracy when establishing levels of alcohol consumption. By contrast, indirect markers are biological parameters that are influenced by a steady and significant alcohol intake. However, these markers are less accurate because they can be affected by other factors, such as medication and health issues. Ethyl glucuronide (EtG) and fatty acid ethyl esters (FAEEs) are specific long-term markers of ethanol: the intoxicating agent in alcohol. It is these two direct markers that are analysed in AlphaBiolabs’ hair alcohol tests. EtG and FAEEs are absorbed via different routes and their levels can assist in assessing excessive alcohol use by an individual. Both markers are analysed because they are affected by external factors in different ways. EtG is produced by the liver and incorporated into the hair, mainly through sweat, and is measured in pg/mg (trillionth of a gram per mg of hair). It is hydrophilic, meaning that it is water soluble. As such, some EtG may be lost through the use of hair dye and excessive hair washing. FAEEs are produced in the blood and incorporated into hair via sebum (an oily substance secreted by glands in the skin). Their levels are measured in pg/mg (trillionth of a gram per mg of hair). FAEEs are lipophilic and therefore not water soluble, so although not affected by hair washing, the amount detected could be affected by use of hairsprays, gels and wax if they contain alcohol. Because of the respective strengths and weaknesses of EtG and FAEE tests, both tests should be performed and their findings should support each other in order to determine chronic excessive consumption of alcohol. 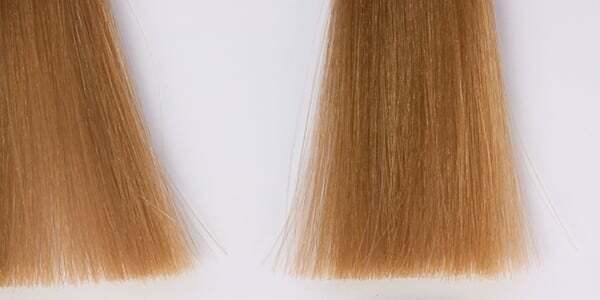 The minimum length of hair for EtG and FAEE tests is a 3 cm section taken from nearest the scalp. Around 200 individual strands are required, which is about the width of a pencil. AlphaBiolabs follows the consensus on hair alcohol testing for chronic excessive alcohol consumption published by the Society of Hair Testing (SoHT). The result will be considered either above or below the recommended SoHT cut-off levels. The level of biomarker found in the hair can help determine if a person has been drinking chronically and excessively, and will show an overview of 3 or 6 months. Some types of body hair can also be analysed for alcohol testing, although head hair is preferred. This is because it is only possible to perform EtG analysis on hair samples collected from the chest, arm, leg, abdomen and beard. The timeframe for body hair alcohol testing is also more approximate due to the nature of this hair growth. Although, AlphaBiolabs’ hair alcohol testing methods are highly accurate and reliable, we would always recommend that a blood test be taken to complement the FAEE/EtG test. This is to support the hair results and, especially in cases of inconclusive results, to provide a greater insight into an individual’s level of alcohol consumption. AlphaBiolabs provides breath, blood, hair and nail alcohol testing. We also offer round-the-clock testing via SCRAM Continuous Alcohol Monitoring®. For expert advice or further information, please call 0333 600 1300 or email us at info@alphabiolabs.com.